A reference to a city that connotes cultivation, refinement, and elegance. 1. Descriptive of or relating to a town or a city: Many people have decided to move from their rural villages to larger urban areas where there are more cultural events, concerts, etc. that are available for them to enjoy. 2. 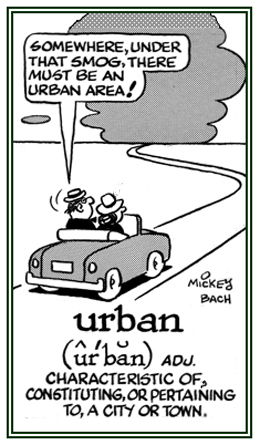 Etymology: from Latin urbanus, from urbs, "city." © ALL rights are reserved. Also known as urban exploration, urbex, or UE; it is the examination of the normally unseen or off-limits parts of human civilization. Urban exploration is also commonly referred to as infiltration, although some people consider infiltration to be more closely associated with the exploration of active or inhabited sites. In the U.S.A., it may also be referred to as "draining" (when exploring drains) "urban spelunking", and "urban caving." 1. Referring to someone who is courteous and refined in his or her behavior: The new principal of the school is a sophisticated and urbane man. 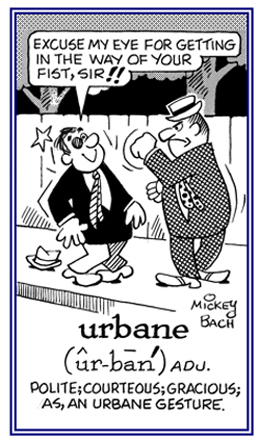 Don't confuse urbane with "urban" because urbane means "refined, suave and courteous" while "urban" characterizes "what a city is like." 2. Descriptive of an individual who has a high degree of refinement that results from significant social experiences with other people: Although Sally is still in her teens, she is considered a very cultured and urbane person. 3. Etymology: from Latin urbanus, "belonging to a city" from urbs, "city." © ALL rights are reserved. 1. The culture or way of life of city dwellers. The expansion of a city or metropolitan area, namely the proportion of total population or area in urban localities or areas (cities and towns), or the increase of this proportion over time.